Is nespresso machine cheap? Things are not always as they seem. Often one takes one look at the price tag of an item on sale and then one makes decision on the economic viability of affordability of an appliance. The same might be true for the range of Nespresso machine. These single serve coffee makers are distinctive in the market place for basically two reasons: their design and their price. I am sure few people would argue that these machines look good. Whether you look at the Nespresso C100, the Nespresso Romeo or even the Nespresso D290,.all of these machines look good. And they make an excellent espresso. However, if one looks at the price tag one might be forgiven for taking a second look. These machines are pricey. While, coffee machine like the Miele CVA 2650 can be forgiven for being expensive, nespresso being so "small" amazes consumers with its price. To be fair this machine looks like one that would be at home in an up market hotel of coffee shop. All of these machines do well to serve an excellent espresso. However, if we reflect on the operating system of these devices they all use the Nespresso single serve system. Now the beauty of the system is not necessarily that you might be mistaken for George Clooney – ala TV advertisements – but rather the ease of operation and the “no fuss no mess” experience of making a fine espresso. 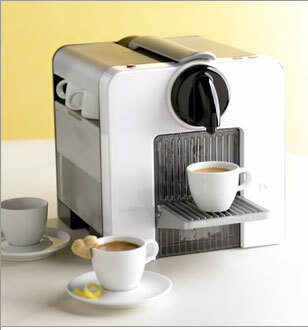 By the way, machines such as the Nespresso Krups will also make a fine cappuccino as will the Nespresso Lattissima. These machines all look like the cool kitchen gadgets that they are. My personal favorite is the Nespresso Essenza range with its triangular shape. These are seriously cool looking machines. However, I digress! The Nespresso system will ultimately save you money and make the machine pay for itself. The size of the filter ground portion is correct every time. Not too much, not too little. This means you will never make an error and have to throw the result away good espresso every time. We are all interested in minimizing wastage. be it coffee, water or money. If you an have the perfect espresso every time then surely this will mean a significant saving in money over time. It follows that the initial expense of purchasing a more expensive Nespresso machine will be warranted as time goes by. It goes without saying that these machines will last.